Collecting accurate time use data is notoriously challenging across demographics, and gender norms relating to definitions of work can even further obscure accurate time use reporting. This month, Monica Jain, Associate Research Fellow at HarvestPlus, shares with us lessons learned on how to measure and analyze women’s time use. By accounting for seasonality, income, and education, her research reveals some of the factors that constrain women’s time use – and some surprising factors that don’t – to see what may shape women’s ability to provide adequate complementary feeding. Complementary child feeding practices are poor in Bangladesh, and they have improved only minimally over time (Jain 2014). Complementary feeding is the process that begins when breast milk on its own is insufficient to meet infants’ nutritional needs. For adequate nutrition, children between 6 and 24 months of age require frequent, nutritious- and energy-dense foods that can be easily digested in addition to breast milk. The special preparation of age-appropriate foods and the frequency of feeding sessions are time-consuming activities. One hypothesis frequently proposed is that mothers in Bangladesh do not have enough time for adequate complementary feeding. We address the question of time availability by analyzing data on time use of women and men in Bangladesh which was collected thrice between 1996 and 1997 in three different agricultural seasons. The data were collected in 1996-97 as part of an impact evaluation of new agricultural technologies being disseminated through non-governmental organizations. 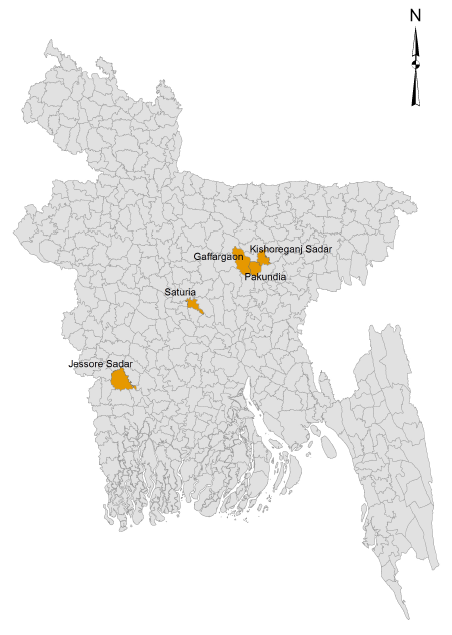 Three geographically dispersed districts were surveyed: vegetable technology in Saturia, group fishponds in Jessore, and individual fishponds in Mymensignh (including Kishoreganj). See Figure 1 for location of these districts. Altogether 956 households were surveyed in the first round and followed in the subsequent rounds. We focus on the time use patterns of married women 15-49 years of age to investigate how time use differs by gender, education, season, income, and presence of young children. We share here our initial findings and reflect on lessons learned about how to accurately collect women’s time use data and uncover different time use patterns across groups of women. Women’s work is consistently and significantly under-reported. Not only do official statistics undervalue the economic contribution of women, but women themselves also underreport their work (Mahmud and Tasneem 2011), both reflecting and reinforcing their lower status relative to men in society. We tested different definitions of work. Using the official definition of work “that a person is working one or more hours for pay or profit or working without pay in own farm or enterprise during the reference period,” we find that two-thirds of women are working. 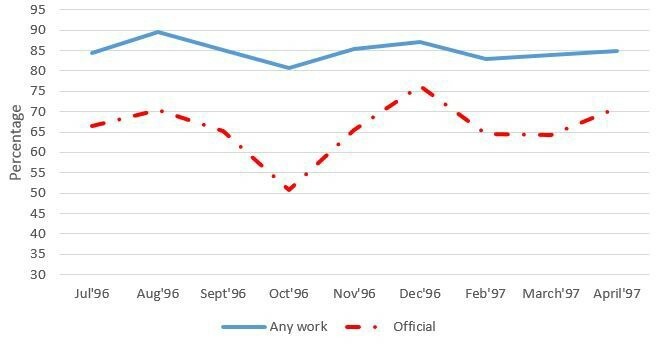 However, if we the remove the lower bound on work hours as per the official definition, the portion of women working increases to 85% (Figure 2). Women spend substantial amount of time on official work activities. We found that women on average spend three hours every day on official work activities. Half of this time is dedicated to own-farm work, and the rest is divided between tending to poultry and livestock and working on handicraft and trade. Women are also the primary producers of goods and services for household use, spending 10 hours a day on work, most of which supports the household. 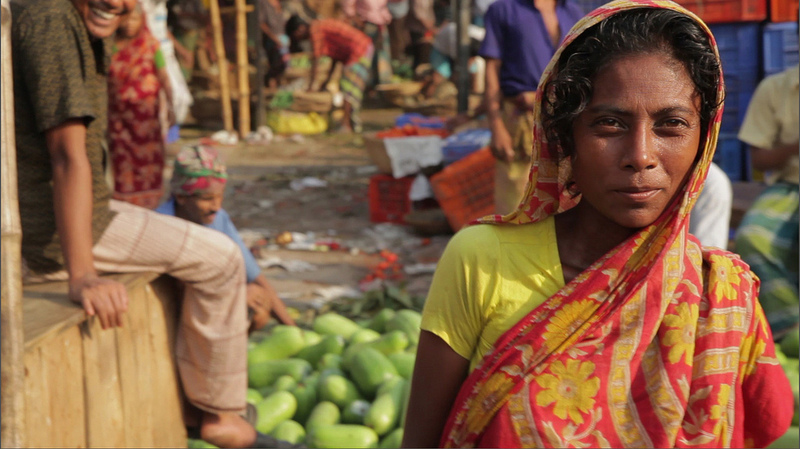 Especially in a country with incomplete and inefficient markets as in Bangladesh, women’s work sustains the household. Women spend six hours every day on household chores, including cooking, cleaning, fetching water, washing, and gathering firewood (Figure 3). When all work inside and outside the household, including childcare, is summed, women in Bangladesh spend 10 hours working per day. Cooking and washing utensils requires an average of four hours per day. Collecting water and fuel takes forty minutes, and cleaning house and clothes another hour. 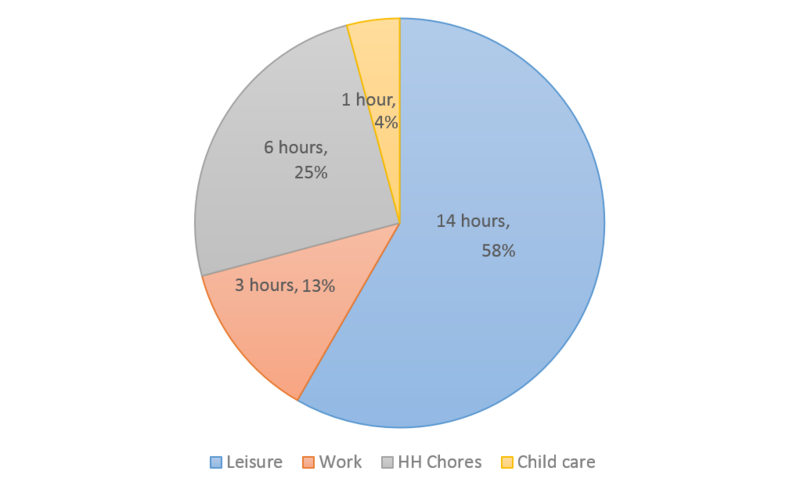 Women spend one hour on exclusive child care activities, such as feeding, bathing, teaching, and playing with children. Women work 4 more hours per day than men in Bangladesh. When work is defined as the time allocated to production of marketed and non-marketed goods and services, inside and outside the household, as well as child care, women spend 66% more time working than men, which is equivalent to four more hours working per day. Principal work responsibilities differ between women and men. Both men and women work in own-farm agriculture, though men spend longer hours. Women are almost entirely responsible for child care duties and housework. Disaggregating by gender is an important first step. We uncovered different patterns of time use when we did not treat women as a monolithic group and disaggregated by income and education. Certain kinds of time use patterns, like for labor and cooking, shift across income groups, but surprisingly, child care remains constant across incomes/education levels amongst mothers with young children. More educated and wealthier women spend less time working outside the home on own-farm work, but more time on household chores, and more time on leisure. As Ilahi (2000) has pointed out, if labor markets function well, as households gain income, they can hire in labor, and household members can lower their workload and consume more leisure. 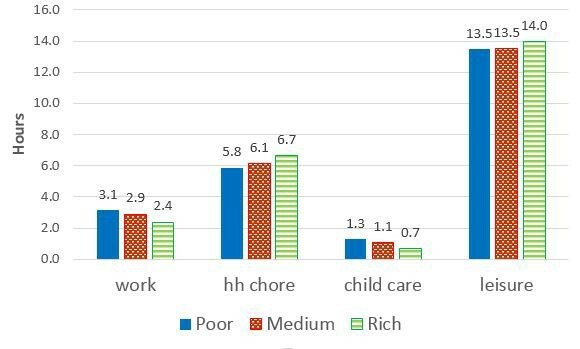 In Bangladesh, both richer women and more educated women (who are also more likely to be rich) work less outside the home (Figure 4). Literate women’s work time varies by season, but illiterate women’s work time remains constant throughout the year. Even in the “hungry season” of October when labor demand is lowest, on average women work two hours every day on official work activities. In the Aman harvest season in December during which demand for labor is high, work time rises to three to four hours. However, illiterate women, who make up two-thirds of the women in the sample, show little variation in their rates of labor force participation or hours of work throughout the year. 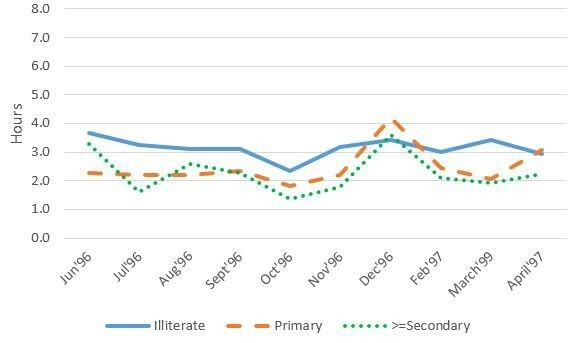 In contrast, literate women work more in response to an increase in demand for labor and consequent increase in wages, like in the Aman harvest season in December, though the changes are only statistically significant for women up to primary education (Figure 5). During the high season when women are most severely time constrained, less educated women tend to reduce time spent on cooking. 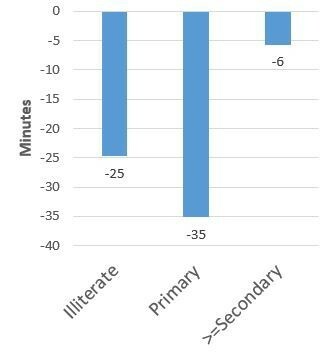 During the Aman harvest season in November and December, illiterate women and women with no education beyond primary school spend less time cooking (& washing utensils) (Figure 6). The work schedule of women with secondary education, however, remains unaffected in this season. Women’s time spent on child care does not vary significantly by education, income level or season. Women with children under five years of age spend on average two hours per day on child care, feeding, bathing, teaching, playing, and caring for them in sickness. Even in the high agricultural season under time constraints, women do not cut down on child care time. Instead, they sacrifice about an hour of work outside the home and an hour of their leisure time. Official statistics and women themselves often underestimate women’s time spent working. Consider alternate definitions of work to capture time use that is relevant to your nutrition variable of interest. Also, work varies by season, so consider carrying out the survey in at least two agricultural seasons. It is a mistake to assume that all women share the same experience. Disaggregating at least by income and education helps reveal important trends, especially with time use. However, sometimes surprising similarities emerge, like the fact that women across income and education levels did not vary in the amount of child care time. To identify these differences or similarities, it is essential to get information on the socio-economic characteristics of the households. It is easy to underestimate child care time since it is often done while multi-tasking with other activities. 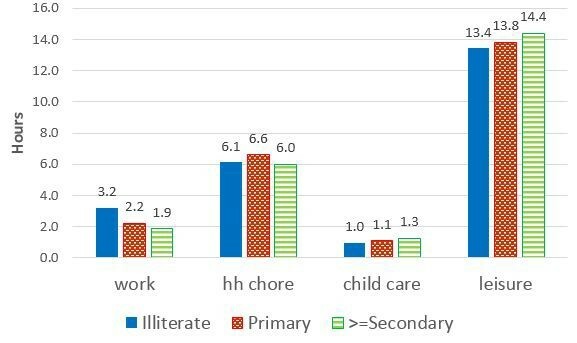 In Bangladesh, women, both literate and illiterate, spend more than two hours simultaneously providing child care with other work activities. Other people, like grandmothers, children, and hired helpers, often contribute to child care. Though we have data that men participate very little in child care, we do not have information on child care provided by other people. If designing a survey and interested in quantifying time invested in child care, make sure to ask about other caretakers. If the aim is to analyze child care time differentials by gender or age, then make sure to get information on the distribution of child care time among siblings by these two demographic factors. Cooking is a major household chore on which women spend substantial portion of their time and there is significant seasonal variation, so make sure to get the time spent on it separately from other household activities. If the aim of the survey is to get information on time use of women headed households, then oversample them as they form only 8% of the women in the survey sample. Time use is one of many drivers of poor complementary feeding practices. Knowledge, income, and access to the right kinds of foods also influence complementary feeding. We are currently analyzing data to look for relationships between time use and complementary feeding outcomes. Preliminary findings are available in Jain and Zeller (2015).